Overcast skies outlined the brick rubble of Ostia like moonlight on tombstones. 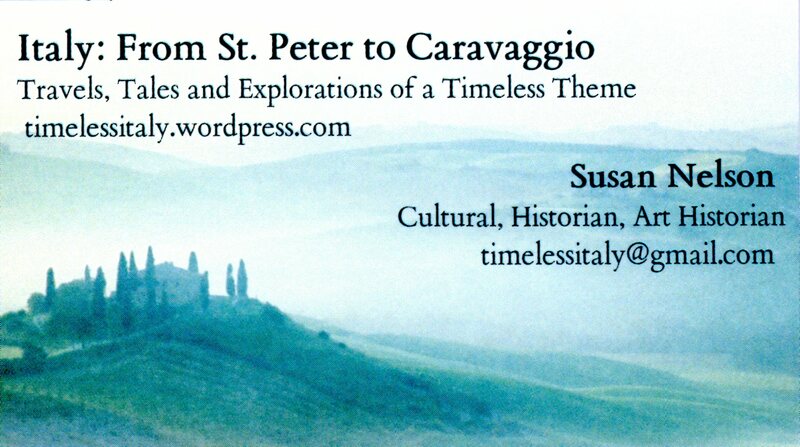 Once a throbbing thoroughfare of trade and business, like Pompeii and Herculaneum, its heartbeat had long since died. Only shadows of the wind sighed and whispered the memory of what was. Taking a short train ride from Rome, I spent the day walking through the sites, exploring a small museum and lunching at the cafeteria. 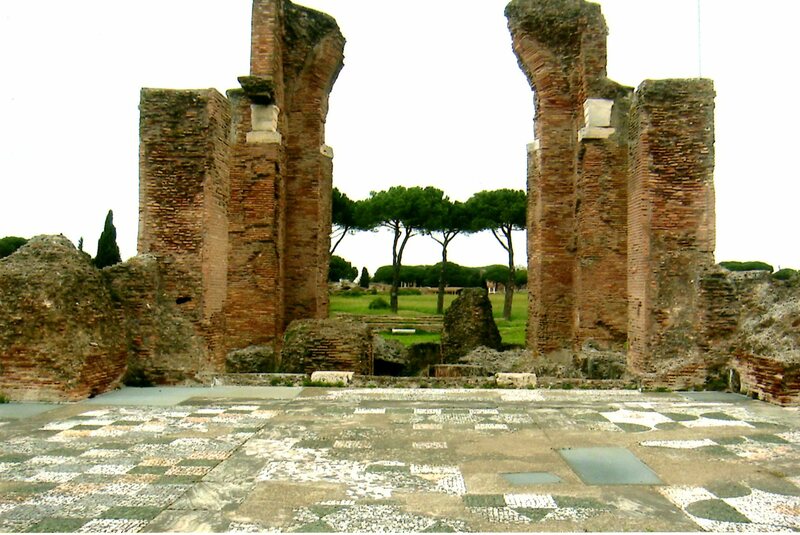 Situated at the mouth of the Tiber River, Ostia (meaning mouth) was once the main seaport and trading hub of Imperial Rome. Sprawled over 80 acres and hosting a population of 50,000 during its mid second century heyday, it lies a short 20 mile train ride down the Tiber River from Rome. Its grid of narrow streets and ruined structures provide historians a continual archaeological dig. Ostia was a prosperous and hard-working harbor town 2,000 years ago, but it was abandoned after the fall of Rome and gradually became buried under silt, dust and collapsing buildings. Fortunately, this was beneficial as the silt preserved the ruins from robbery and decay. 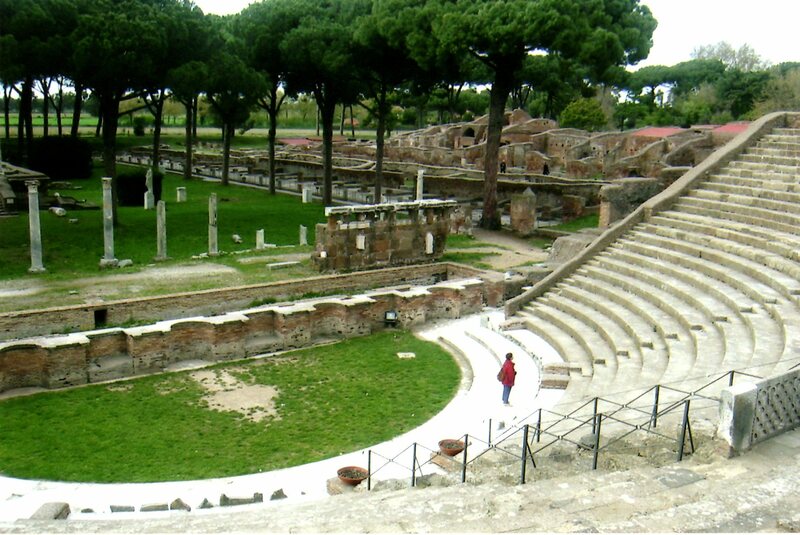 In fact, because of the infill of silt, Ostia Antica now lies over 2 miles inland from the water. 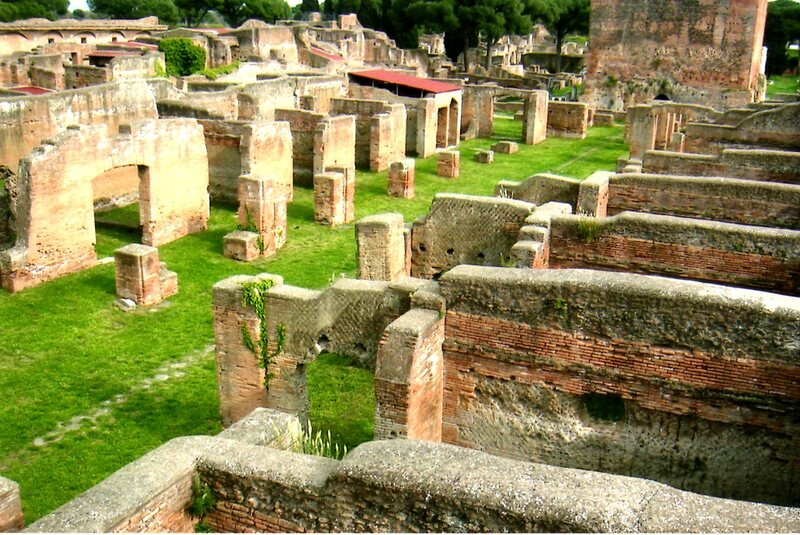 What a lot of people don’t know is that Insula, or apartment complexes up to four stories high, were very common residences in Ostia as well as Rome. For example, the Insula of the charioteer was an upscale version, built around a large central courtyard. Secondary courtyards, corridors, internal and external staircases, and several apartments of varying sizes indicate a more elaborate living quarters than usual at the time. 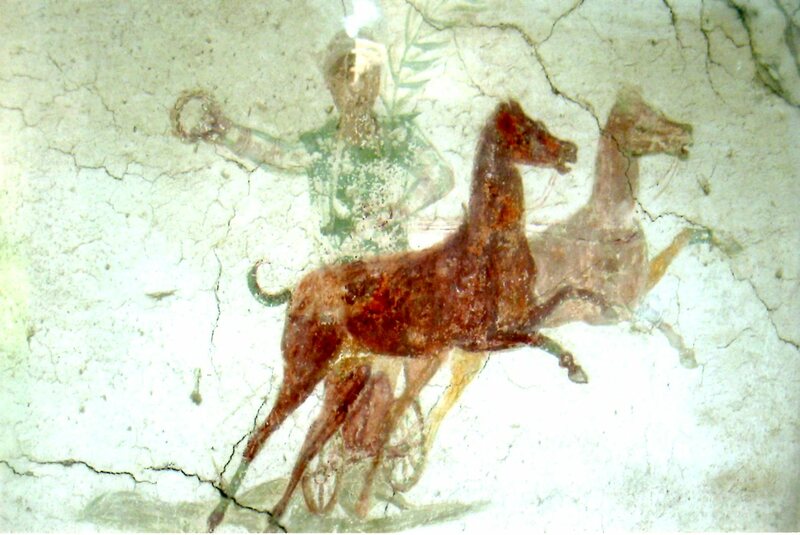 The charioteer painting, one of two found in a room off the east portico, gave the complex its name. Some thought exists that the complex was instead the seat of a large sporting association because of the paintings. Market Arcades were endless. Along many narrow streets were tabernae, single-roomed shops with a mezzanine above where the shopkeepers lived. Staircases between the shops lead to the upper floors. 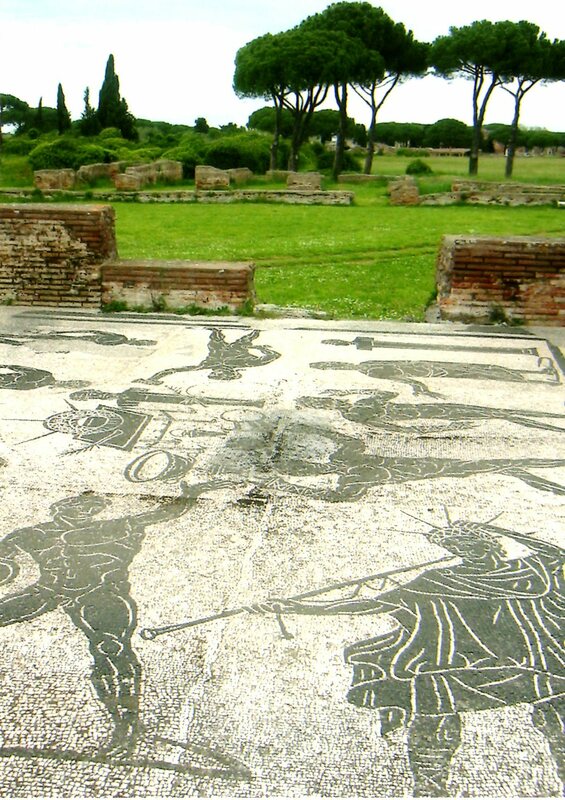 Several floor mosaics, one of Neptune among his mythical sea creatures, are still intact throughout the complex. They were usually placed inside the many public baths or residences. Enjoy a summer play or dance performance in the old Amphitheater. Partly restored during the Mussolini era, the amphitheater provides excellent views of the stage and town after climbing to the top row of seats. Acoustics can’t be beat!